We work hard at Websticker to add value to every promo sticker creation project we work on, and include a 1/2 hour of consulting and design assistance with every job. 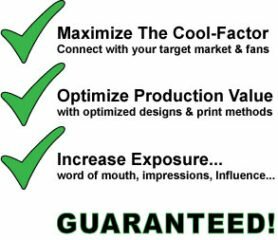 But, in many cases, that is simply not enough time and extra creative design services are needed to boost promotional power or profitability. 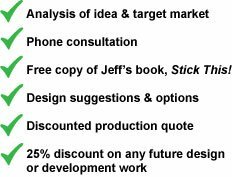 So, we've put together a few easy starter sticker design packages to guarantee better, more profitable products and to create more powerful promotional tools. Get feedback and optimized designs before you buy with this sticker design service! This service is perfect for individuals with strong sticker product ideas, businesses that want to create profitable add on products or any organization looking to get the most out of this awesome guerrilla marketing tool. Expect an e-mail from us with a link to a Design/Marketing Brief. 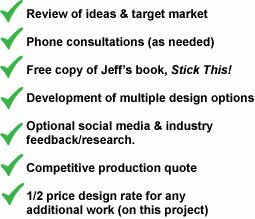 This is where you can fill in all the sticker design information about your project - info that will help us get our creative juices flowing and outline key attributes and marketing needs. We'll call you with any sticker creation questions and to brainstorm initial ideas. A dedicated designer will begin work on multiple design ideas. Creative slogans and copy can be developed as well if needed. Sticker design mock-ups will be e-mailed and we can begin a back and forth dialogue to hone in on optimized designs. When design options are narrowed we'll review pricing at various quantities. Then we can proceed with order and/or discounted development of other designs or products. Hour of Power Sticker Design: $100. If you have a large manufacturing run or potentially lucrative idea, we want to start a dialog, offer feedback and get you the best possible pricing. Contact us to set up a 5-15 minute custom sticker development phone meeting to discuss how we can best optimize the design, quality and price on your sticker project.